I belong to the generation that spanned the entire pontificate of the man we now know as St. John Paul II. Even now, I speak about "Pope Benedict" and "Pope Francis," but when I say the Pope I mean John Paul II. In fact, for our generation he was always more than "just a Pope." Through him, Jesus grabbed hold of our minds and hearts. We went from being confused and weak to being convinced and ardent. John Paul II evangelized and catechized us. He showed us the face of Jesus. It was a face we desperately needed to see. Growing up in the 1970s was very difficult, and few of us came through unscathed. We were the children of the 60s, of all the upheaval and reevaluation that opened up in those times as the last rotting support beams of what had once been the edifice of the "modern world" gave way in dramatic fashion. And when those last walls fell we found ourselves surrounded by fascinating and terrifying instruments for exercising power over the material world -- power to communicate and learn, to build and heal in remarkable ways, power to move from one place to another, power to manipulate our own bodies, power to shape our imaginations and those of others and to foster great illusions, power to expand our horizons and also to widen vastly the scope of self-indulgence and self-deception, power that opened up whole new categories of subtle psychological and emotional manipulation and violence, power for greater empathy and solidarity with others and also to destroy ourselves, one another, and our environment. All of this power was within the reach of our emerging personalities and freedom... a freedom that shivered in the winds of this strange new world, seemingly boundless but with no sense of direction, no idea which way to move or where to go. So we experimented. We played with these powers like toys. We found good things and had beautiful experiences. We also did violence to ourselves and to one another; even as we worried about unspeakable weapons of mass destruction, we committed innumerable micro-atrocities that so many of us are still not ready to face. Catholic Christians in the developed world in the 70s faced the same disorientation as the wider culture. The Church of Blessed Paul VI was heroic, but she was enduring a kind of martyrdom. She was a seed plunging deep into the earth, destined to bear tremendous fruit, but at that time far below the horizon of those of us who were thrown into the wild, primal seas of the new culture of power. We were desperate for a way to survive. The amazing new world of possibilities and urges and speed and images was like a great flood. We couldn't direct it. We hardly knew what to do as it engulfed us. We had become lightheaded and out of focus, choking beneath the waves, dizzy from the lack of oxygen. I can't express what St. John Paul II did not only for me but for our entire generation. People have to understand: we were drowning, DROWNING, and he rescued us. He showed us that we were human beings, and that following Jesus was the way to find our true selves. He held up to our gaze the image of Christ, the greatness of Christ. He convinced us that Christ could give meaning to our lives, that Christ was stronger than all the forces raging around us and within us. With Christ, we could find the way to live in the midst of the flood, and even to walk on the water. 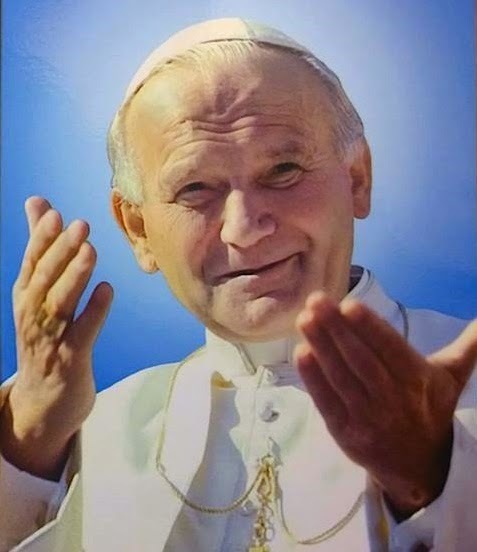 The Lord used St. John Paul II to rescue us. That is why my generation loves him so much, and why we will never forget him.